THE INLAND WATERS RULE: Can Numeric Water Quality Criteria Save Lake Erie? Fortunately, the water quality in Lake Erie vastly improved in the 1970s and 1980s, primarily as a result of aggressive actions combating point source pollution. 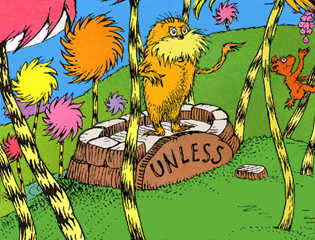 When Dr. Seuss was informed of these improvements, he removed the reference to Lake Erie in the 1992 edition of the children’s book. Despite the success of prior efforts to clean up the lake, however, pollution is once again threatening to kill Lake Erie. This time, nutrient pollution from nonpoint sources is the primary culprit. By depleting levels of dissolved oxygen in the water, these excess have created a dead zone in the lake’s central basin where nothing can survive. According to one study, the Lake Erie Dead Zone larger than the State of Delaware. Moreover, as I discussed in a previous post, nutrient pollution increases the frequency and intensity of Harmful Algal Blooms (HABs), which pose a serious threat to human health. Lacking the implementation of a scientiﬁcally guided management plan designed to mitigate these impacts, we can therefore expect this bloom to indeed be a harbinger of future blooms in Lake Erie. How Can Existing Legal Tools be Used to Combat Nutrient Pollution? Under Section 303 of the Clean Water Act (CWA), states are required to develop water quality standards for water bodies that are sufficient to “protect the public health or welfare, enhance the quality of water,” and serve the overall purposes of the Act. 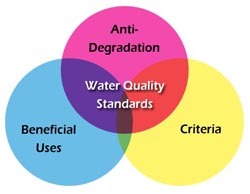 Water quality standards have several components, including the designated uses of a water body, water quality criteria necessary to protect those uses, and anti-degradation policies for protecting the water body from pollutants. States must submit their water quality standards to EPA for review and approval. If a state fails to adopt water quality standards for a water body, or if the EPA determines that a state’s proposal is inadequate, the EPA is required to propose a federal standard that will apply to that state. While states have the primary authority for designating uses, the EPA is responsible for developing water quality criteria based on variety human health, welfare, and ecological considerations. Because the language in Section 304 is mandatory, the EPA is required to develop criteria for water quality that “accurately reflect[s]” latest scientific knowledge. As stated above, one component of a state’s water quality standards is water quality criteria, which may be expressed in either numeric or narrative form. The EPA defines the latter as a narrative statement that describes a desired water quality goal, such as a quality of water sufficient to support a particular use. Numeric criteria, on the other hand, consist of a “measurable value determined for the pollutant of concern that, if achieved, is expected to result in the attainment of water quality standards” in an impaired water body. Unlike narrative criteria, which are generally more subjective and less precise, numeric criteria are better equipped to identify impaired waters and assist states in developing TMDLs. Moreover, because they create valuable baselines, numeric criteria are particularly useful for addressing nutrient runoff. See, e.g., Legal Tools for Reducing Harmful Algal Blooms in Lake Erie. For these reasons, the EPA takes the position that numeric standards are not only preferable but “are ultimately necessary for effective state programs.” However, although the agency has long encouraged states to establish numeric water quality criteria for phosphorus, many states have refused to do so. Summary of numeric criteria development for nitrogen and phosphorus pollution in the United States. Of the four states that border Lake Erie, New York is the only one that has established any type of numeric standard for phosphorus; Ohio, Pennsylvania, and Michigan currently have no numeric water quality criteria for any type of nutrients. In Ohio (the largest contributor of pollution into Lake Erie), the only water quality criteria applicable to nutrient pollution is the State’s generally applicable narrative criteria. This narrative standard—which applies to all surface waters in the State—simply requires that such waters, to the extent practicable, be “free from nutrients entering the waters as a result of human activity in concentrations that create nuisance growths of aquatic weeds and algae.” Despite the difficulties inherent in enforcing this type of general narrative standard, the EPA had never before proposed numeric criteria for phosphorus for any state. Photo courtesy of St. Johns Riverkeeper. Claiming that Florida’s narrative criteria were inadequate to meet the requirements of Section 303, environmental groups filed suit against the EPA in 2008 for failing to set numeric nutrient criteria for the State of Florida. After the lawsuit was filed, the EPA issued a determination in which it agreed that numeric nutrient water quality standards were necessary for Florida to meet the requirements of the CWA. Nutrient pollution in marina on Caloosahatchee River near Cape Coral, 2005. Photo courtesy of EPA.gov. Before the litigation was resolved, the EPA and the environmental groups entered into a consent decree that required the agency to propose in stages numeric water criteria for all waters within State of Florida. See Florida Wildlife Fed’n, Inc. v. Jackson, 2009 WL 5217062 (N.D. Fla. 2009). Algal Bloom Along Florida Coast (Feb. 2009). Photo courtesy of Earth Snapshot. The EPA acknowledged Florida’s efforts to address nitrogen and phosphorus pollution, but explained that the “combined impacts of urban and agricultural activities, along with Florida’s physical features and important and unique aquatic ecosystems,” make clear that “the current reliance on the narrative criterion alone . . . do not ensure protection of applicable designated uses. According to the EPA, this justified its decision to propose numeric criteria for Florida’s lakes and flowing waters. The agency also proposed criteria for marine waters in late 2012, which it intends to finalize by September 2013. Image from Waterkeeper Magazine’s Winter 2010 Edition. The EPA recently stated that 78 percent of coastal waters within the United States exhibit eutrophication as a result of nutrient pollution. Given the magnitude of the problem, any solution aimed at reducing nutrient pollution will inevitably require substantial expenditures ­—and will therefore face significant opposition. However, because the Inland Waters Rule involves the EPA’s first attempt to impose numeric nutrient criteria necessary to protect a state’s designated uses, many legal analysts believes the regulation will have broad national implications. If Florida’s Inland Waters Rule can withstand these attacks, it may serve as a model for impaired waters across the country—and might provide the only key to saving Lake Erie. This entry was posted in agriculture, algal blooms, Clean Water Act, dead zones, environmental cleanup, environmental health, environmental law, EPA, Great Lakes, nonpoint source pollution, water quality standards. Bookmark the permalink.